We know adventurers are hard at work collecting as many Insignias as possible to find the best bonuses for each character they have. In order to help out your collection, we’re now offering a bundle of Enchanted Keys & Insignias in the Zen Market. 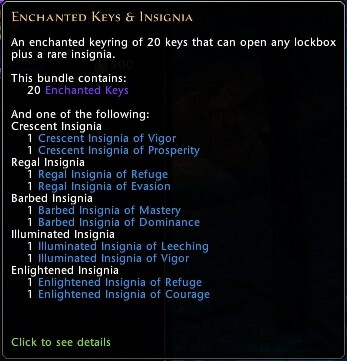 With the new Firemane Lockbox, Enchanted Keys are your “key” to obtaining the majestic Golden Lion and the upgraded packs available. This bundle contains a keyring of 20 keys! We hope you find that last Insignia you need and are able to slot it in the Golden Lion mount!